Located in Bemidji, Minnesota, Iverson Corner Drug is a locally owned and operated pharmacy. Our downtown pharmacy dates back to the late1800's with ties to the Headwaters Area Region. After graduating from North Dakota State University with his pharmacy degree, Paul Iverson moved to Bemidji and in 1985 began working at Thomas Drug located at 401 Beltrami Ave. Paul had a vision of a pharmacy centered on patient care. 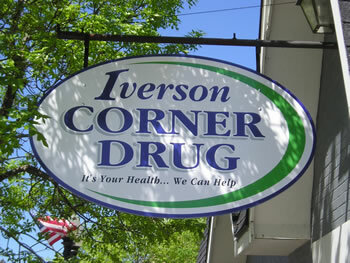 Feeling the entrepreneurship tug, Paul purchased the pharmacy in 1990 and renamed it Iverson Corner Drug. In 1993 the pharmacy was remodeled for the first time adding space for private counseling of patients on their prescriptions and medical concerns. To further solidify the patient care focus, the pharmacy started stocking more medical equipment and medical supplies, while reducing the gifts and cosmetics sales. In 1996, Iverson Corner Drug added its first patient care program, developing a program to help people with asthma better manage their disease. Since then other programs have been added, such as smoking cessation, cholesterol and diabetes management. The ability to be able to do lab work on site, measuring cholesterol and hemoglobin A1C, was also added. April 2009, Iverson Corner Drug moved to its current location on Minnesota Ave. The new location proved to be ideal, in allowing Iverson Corner Drug to stay downtown to serve our patients better, and has provided better access and parking for patients. In November of 2018, the pharmacy was purchased by Ryan Okerlund. Ryan started his pharmacy career at Iverson Corner Drug in 2003. After leaving to be Pharmacy Manager at Pamida Pharmacy, he worked as a hospital pharmacist at Sanford in Bemidji. He returned to Iverson Corner Drug in 2015, coming on as a minority owner, with plans to purchase the pharmacy. Today, Paul is golfing year-round, spending his winters in Arizona. Ryan's plan is to continue the excellent patient services and focus on health that Paul started over 25 years ago. Today, Iverson Corner Drug continues to be a leader in the pharmacy profession. We were one of the first pharmacies in the state to offer a private area for our patients to consult with a pharmacist about their health concerns. We were the first pharmacy in Bemidji to provide vaccinations, CLIA waived labs, and provide patients access to Medication Management services. We continue to support and invest in the future of pharmacy by hosting pharmacy rotations for 4th year pharmacy students and internships for pre-pharmacy students. Our longest-working employee, with over 20 years experience! Heather is our wonderful data-entry tech, and insurance guru. Cara is our newest tech. She was gone recently, welcoming her second baby into the world! McKayla is expected to begin Pharmacy school very soon! Breanna is our awesome fill-in staff member, who is finishing her degree as BSU. Tracy is an excellent tech, and certified therapy dog trainer! We only get to see Kym a couple times a week, so we make the most out of her great smile! Brenda is our bookkeeper, and go-to person for all billing questions. Stephen is our Saturday guy, who will hopefully be joining McKayla at the U of M for pharmacy school! Our Saturday pharmacist, who actually did her 4th year training with us!